To configure the Radius Server click on Config → Networking → Radius. Reject IP 0 - Reject IP range when user not found (real). Reject IP 1 - Reject IP range when user is blocked, not active or not in system. Reject IP 2 - Reject IP range when user has negative balance or filter is applied. Reject IP 3 - Reject IP range when user has wrong MAC address (if enabled) or other error. Reject IP 4 - Reject IP range when user has entered wrong password. Prevent duplicate session - If a customer is online and try to connect, send disconnect package to online session. Allow with no account balance - Allow ballance with minus. Allow without IP/MAC - If disabled, IP/MAC will be checked during authorization. If enabled, authorization will be allowed with any IP/MAC. Inverse rate limit - Change rate limit of upload by download and vice versa. Inverse accounting - Change accounting of upload by download and vice versa. Accounting interval (in sec) - Set time to update accounting. Customer Block - Set blocking type. Radius incoming port - Set port for incoming. 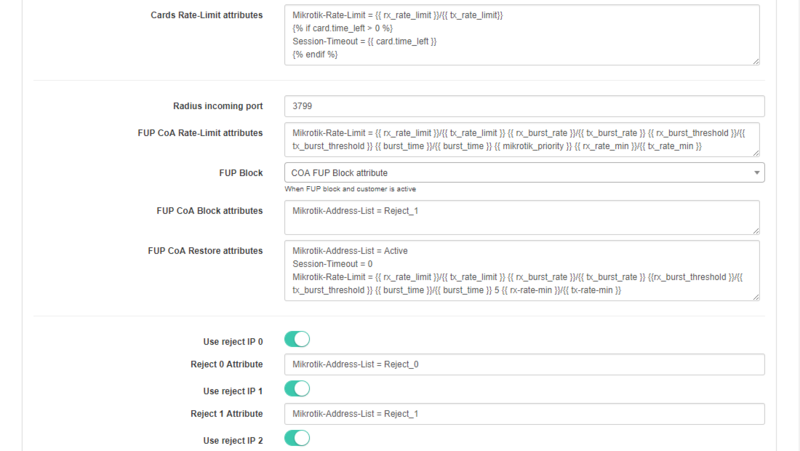 FUP Block - Set FUP blocking type. Use reject IP [0-4] - Enable to use the IP's 0-4 explained in first step. Error session time limit - limitation of the session time (in seconds) in case of an authorization error, forcing users to reconnect after a time out (for customers that do not have any active services). This is necessary in order that after activation, the customer received his address from splynx, without manual reconnection on his part. There are two buttons at the bottom to Restart radius and Clear all online sessions.